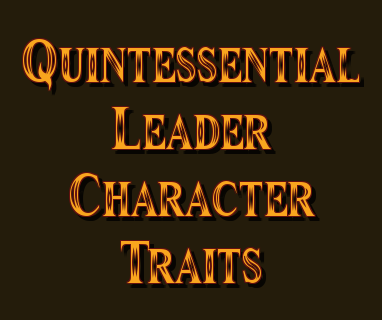 Quintessential leaders have character traits that distinguish them among people in leadership positions. While quintessential leaders have imperfections, make mistakes, and sometimes fail spectacularly, these character traits define how they handle themselves in both the worst of times and the best of times.One of the most defining character traits of quintessential leaders is how they see themselves and how they communicate about themselves. Quintessential leaders, first and foremost, see their own humanity. Because they spend a lot of time looking inside themselves to see what needs to be removed, what needs to change, and what needs to improve, quintessential leaders don’t see themselves as the end all and the be all to everyone and everything (self-importance). Because of this, quintessential leaders have the character trait of humility. They see themselves as peers to the rest of humanity, and that characterizes their behavior. They don’t make exceptions for themselves because they are in a leadership role. They have great compassion and empathy, and a strong desire to help other people grow and succeed. They don’t have envy or jealousy in any part of their lives. As a result, the conversation of quintessential leaders is never “it’s all about me.” Quintessential leaders don’t brag about themselves: their intellect, their accomplishments, their talents, and their abilities. Those things are irrelevant because in the big scheme of things they don’t matter. What does matter is who and what we are and how we are using who and what we are to serve God and others. That’s the bottom line. And when quintessential leaders are unfairly attacked and untruthfully maligned, which is what most of us humans seem compelled do to each other with increasing frequency these days, quintessential leaders take the high road. The high road consists of silence, a refusal to take the bait and engage, and absolutely no desire for revenge or vengeance. One of the underlying characters traits that quintessential leaders have that gives them the ability to take the high road is self-control. In these early days of 2018, we are once again seeing the opposite of this aspect of quintessential leadership in the person who is in the role of president of the United States: President Donald Trump. 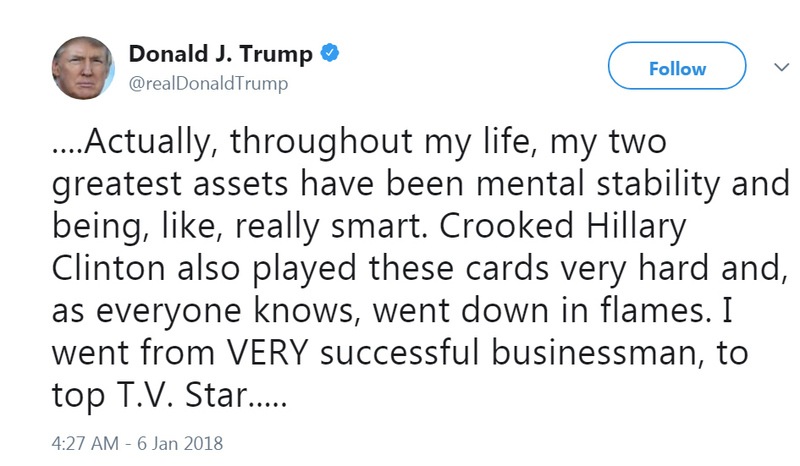 This is, sadly, not new behavior for this president, but it shows the kind of person he is at the core of his being: how he sees himself and how he communicates about himself. 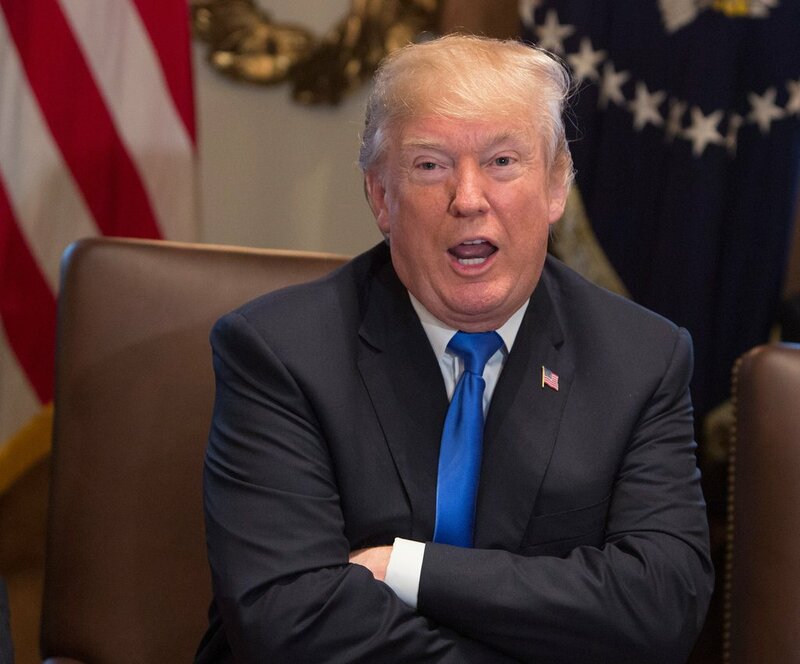 Among the excerpts were claims attributed to inside sources at the White House that suggests that President Trump is not particularly intelligent (we know for a fact that, by President Trump’s own admission, he doesn’t read, and while that of and by itself is not an indication of native intelligent and aptitude, it is unprecedented in a role that requires a deep understanding of governing nationally and internationally) and that he is not mentally well (after almost two years of observation, it seems very likely to me, even beyond President Trump’s natural narcissism and strong aversion to the truth, that he is showing classic signs of cognitive impairment, with frontotemporal lobe involvement). As President Trump is wont to do at the slightest provocation, he took to Twitter at o’dark thirty to set the record straight about himself. This is the opposite of what a quintessential leader does. First, if a quintessential leader is attacked or maligned, they simply don’t respond. Responding gives the person who is attacking or maligning a semblance of credibility and it also gives them a public voice and forum in which they can continue to attack and malign. Quintessential leaders shut down the conversation before it can even start. If the person defaming them is right, then words and actions will bear that out over time. The same is true if the attacker is wrong. As to the content of President Trump’s tweets and then his clarifying statement later that day to the press, this is unquintessential leadership on steroids. Mental stability. People who are mentally stable don’t going around telling people they are mentally stable (or “normal,” which is a euphemism for “there’s nothing psychologically or psychiatrically wrong with me”). They don’t have to because the evidence of whether we’re mentally stable or not is apparent in who and what we are, we say, and we do. The reality is that we all have instances – loss, grief, death, etc. – in our lives where we’re under stress mentally (this doesn’t mean we’re clinically mentally ill or chronically mentally ill) and we, quite frankly, are not as mentally stable during those instances as we are in general. Chronically – and this means untreated (therapy) and unmedicated (psychiatrically) – mentally ill people never question their own mental stability. In fact, they usually believe that everyone else is mentally unstable and they alone are not (delusional thinking). As for intelligence, really intelligent people – even geniuses – never say anything about their intelligence. They don’t have to because, again, intelligence is evident in who and what they are, they say, and they do. The other thing that stands out about really intelligent people is that they know what they don’t know. They don’t pretend to know everything about everything, because the reality is as much as we humans think we know, it’s a blip on the radar of what there is to know. As a result of knowing what they don’t know, really intelligent people never live with the idea that there’s nothing else to learn about everything. They are lifelong students, and not just for knowledge’s sake, but for deeper understanding and better application of that knowledge and understanding. I saw a comparison, based on this incident, of President Trump to Fredo in The Godfather. It was an intriguing, and sadly accurate (anyone who’s seen The Godfather I & II and isn’t heartbroken on some level by Fredo must have a cold, cold heart like Michael Corleone). While I agree with the comparison to Fredo Corleone, much of what I’ve observed in President Trump reminds me in very subtle ways also of Antonio Salieri in Amadeus. In either case, at the very least, it is a sad and a pathetic portrait. But this is also unquintessential leadership in how President Trump sees himself and communicates about himself. For those of us who are striving to become quintessential leaders in every aspect of our lives, this is an area that we need to consider deeply about ourselves. How do we see ourselves? How do we describe ourselves to others? And I would urge us all to take a hard look at what we do on social media. This is a very seemingly innocuous avenue for the same net effect of being unquintessential leaders in how we see ourselves and how we communicate about ourselves. And, unlike President Trump, I don’t think we may even be consciously aware (I know with many people that this is not their intent on social media, but it’s trap and it catches you before you even realize what you’re doing) that we are mimicking his behavior in our own online behavior.